Tupras is Turkey’s largest industrial enterprise. The utility operates four oil refineries, with an annual total of 28.1 million tons in crude oil processing capacity. Activities within the refinery yards, in particular in and around the oil tank valves, must be monitored 24 hours a day using real-time high-definition video surveillance and recording technology. Tupras evaluated a number of wireless options, but with professional guidance by Dengebir, one of RAD’s leading system integration partners in Turkey, chose RAD’s Airmux-5000 point-to-multipoint broadband access radios, which transmit over unlicensed frequencies and, therefore, do not require any broadcast license. Provide high bandwidth connectivity and backhaul for multiple HD video surveillance cameras with nLOS transmission requirements. RAD’s Airmux-5000 sub-6GHz point-to-multipoint broadband radios. The Airmux radios are installed at oil refineries in Izmir, the country’s primary Mediterranean port, and Izmit, about 100 kilometers east of Istanbul. The Airmux-5000 base stations, supporting to 200 Mbps, work opposite dozens subscriber units, each uploading 10 Mbps guaranteed bandwidth. 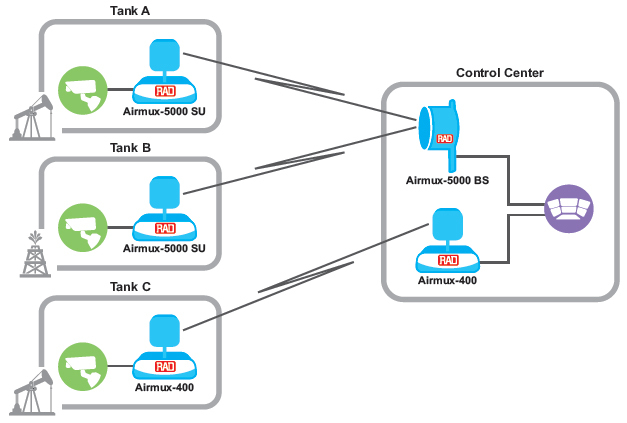 The Airmux-5000 family supports ups to 750 Mbps for bandwidth-intensive applications.